Definitely not a fan. I paid for FeedDemon back before it went free, you've already gotten money from me. I love your product, but I really don't think this is a fair solution. Whilst not lauding the idea of putting adverts in my favourite RSS reader I can completely understand (and accept) the need to do this. At least they are ads from the deck which are usually tasteful and of at least some interest to computer literate crowds. Love the 2.8 builds so far and I'm sure the final 2.8 will be ever popular. I understand your concerns and you are welcome to continue using the version you already have. We have an obligation to balance several competing concerns, the first of which is user experience and the second is sustainability. I'm sure that you would agree that having a version of FD w/ads that also benefits from continued enhancements is better than having a version of FD that basically stagnates as we focus our resources elsewhere in our business. I think Nick has done a really masterful job of balancing the usability issues by managing the placement of ad content and by working with an ad network that is very much geared to the tech and creative community. Ads can provide utility when the content and placement appeals to the community of people using the app displaying the ads. I also paided for FeedDemon before it went free. I wasn't mad that I'd paid when you decided to make FeedDemon free. I wasn't even really mad when I saw there would be ads in it. But for some reason the casual nature of you're reply infuriates me. I tried FeedDemon and then gladly paid my $30 under the impression that I would receive a great product with updates for the foreseeable future. When it went free, that didn't really change anything. Updates were still coming and I was happy. But with ads, it seems like I'm being forced to pay for this product all over again. I don't care how "tastefully done" the ads are, they're still ads. They take up screen real estate that I could put to better use by showing a few more feeds in the sidebar and it's a betrayal of my trust. I really do understand the need to monetize the product, but at least bring back an ad-free paid version (with, of course, a MAJOR discount for those who have already paid once). I was a paid FeedDemon customer (who would consider paying another small fee to keep ads out of the product). If the ads go in, I go away. No thanks to any advertising in FeedDemon. Also paid for FeedDemon before it was free. Happy to pay for an ad-free version again. Agree with many of the above: I'd like to see a no-ads option for those of us who paid out for FeedDemon just weeks before you announced it was free, or failing that a refund. I'm a huge fan of FeedDemon but ads in a product I've paid for would really piss me off. I love how you guys act like they owe the earth and the sun because you put down a measly $30, once, a long time ago. Also, just because you would pay for it doesn't mean that would be enough to support the product. I'm guessing they will make more off ads than they would of charging for the product. I agree. I paid for it a long time ago (Nov 2005) & I have tried many versions. I usually look forward to upgrades but I do not like this version with ads. Love the product and would pay an upgrade fee to avoid ads. Ditto - I paid. I have no problem paying in the future. No ads for me. @MenoRikey Some of us have indicated we'd be willing to pay (again) for an ad-free version. I hardly think that qualifies as us saying "they owe the earth and sun". I understand that Newsgator needs income to survive. I'm stating that I'd prefer to pay a fee and not have ads. Know what? I paid for FeedDemon many moons ago and this change doesn't bother me a bit. NewsGator is giving GREAT SOFTWARE AWAY FOR FREE, and I'm glad they're at least experimenting with a way to support the software. Let's be realistic here... it costs time+money to develop software. I want FeedDemon to stick around and continue to get better. I too would pay for an ad-free version, but I can deal with ads as long as they stay out of the way and don't impede my ability to use the app. Just to reiterate what's been already said, I, too, paid for FD when it wasn't free. I also didn't really mind when it went free; however now having ads foisted upon me does stick in my craw a little. Naturally the first thing I'd be doing is blocking the ad server at the firewall, but that will still leave the rectangular scar of where the ads should be appearing. OK, so far the response has been overwhelmingly negative, which isn't unexpected. But could I ask those who don't want ads to at least try the test version that has them enabled? I realize that the whole idea of having ads is going to bother some folks, but I'd still like to know whether the way I've implemented the ads is distracting, intrusive, etc. Thanks! I'm another past purchaser of FeedDemon and had renewed for the online service at least once prior to FD going free. I'd gladly pay a nominal yearly fee for FD. If ads go in though I'll either move on to another client or block them via my hosts file or proxy. Yes ads are very distracting. I use 2 monitors but prefer 800 x 600 resolution (larger type) since I look at a computer all day. Ads block my view of some subscriptions and watches entirely (now must scroll). In the midst of all this I needs to be said that I think you make a great product. I honestly feel sorry for you being stuck here. That said, I can't even stand having the little FeedDemon News box open and have often wished that I could even get rid of the little sliver when it's minimized. I think it's more than safe to say that the ad box would be in my way. I'm a NetNewsWire user, and I guess this means we'll eventually see ads turning up there too, since both are owned by NewsGator. I actually don't mind the ad size and placement from the screen shot, since ads in feeds are so prominent these days, that one more ad in the corner isn't going to make a dig difference. When NewsGator's sync service was out briefly the other month, I was reminded how agonizingly slow a full feed refresh was without the benefit of the NewsGator backend. If this is the price to pay to continue getting that service for free, then I'm fine with it. As yet another past purchaser I'm in agreement with many of the comments so far. Ads are blocked by AdBlock Plus in Firefox, and I deeply resent having them foisted on me in FD. If NG can't offer a free service without ads they should never had done away with paid subscriptions. Is there a consideration for having a paid no-ad version of the software? I would *gladly* pay a one time fee for the software (which I already did, but would do again in this case), or a yearly fee. I'm somewhat naive in how ad revenue works. Is it based on how many times the ad is shown, or how many times it's clicked-through? I, for one, on principle, would probably not click on any ads. (And eventually, like most web sites, my eye would be trained to ultimately ignore it). But if it's how many times it's shown, that's immaterial. I can't stand ads at all. I'm not trying to be cavalier in my response to you. I apologize if that is how you interpreted my remarks. We are trying something new and quite frankly it's driven by an economic reality facing every business right now. It's also worth pointing out that even when you paid for FD originally you were not getting major upgrades as part of that original purchase so while we have shifted to free product and now ad supported, you are getting product feature upgrades at the same time and are committed to doing so in the future. Nick has put out FD2.6 in January, FD2.7 in May, then the current FD2.8 beta. The benefit of the free model has and always will be continued development without having to pay for upgrades along the way. I'm also a long-time FD user (since the Beta days) and paid for the product. I fully understand the need to support the business and would consider paying for FD again as it is a better product for me then the web based versions. But if ads come in I go away. I'll have to try the new beta to see if the transition from one ad to the next is distracting -- I imagine it would be. The general agreement is that we are already in a world recession which could well become the worst since the 1930s: although I dislike them, if the adverts are the means to keep the application free in such a poor economic climate so be it - they are as unobtrusively done as adverts could be without losing the point of the advertising! I would appreciate the option to pay to remove the adverts, although that should be a one-off and have nothing to do with previous payments (I paid for FD years ago and the serial numbers etc. are lost - I don't even remember what email address I used to sign up - and I feel that trying to marry up old payments with new payments would be a logistical nightmare). I don't often comment on items, but this topic has piqued my interest. There is no denying FeedDemon (FD) is a GREAT product and needs support for future development. That's why I originally paid $29.95 for FD in its early days (on 12/17/2003 to be exact). Nick, has it really been 5 years? Wow time flies. Then Nick and Newsgator joined forces and FeedDemon became free. Great! The audience using FeedDemon was greatly increased and all those new users saw how great FD was. I must admit I felt a little twinge that I had paid for what was now free software, but FD continued to evolve and improved with each update. I've paid a lot more for software that was a lot less than what FD is. Now the issue of how to fund ongoing development of FD arises. Adding ads is being considered. Yes, I have tried the new 2.8.0.8 RC1 with the ads. The ads aren't too intrusive and change infrequently. However, they are still there occupying some of the application interface area and the simple fact that there are ads is a minor irritant. If ads support FD development, I suppose that's the price I'll pay to continue using FD. However, you may want to consider the model Eudora used - the free version had ads, the paid version didn't. Personally, I would strongly prefer paying a reasonable one-time or at most an annual fee to turn off the ads, and letting those who use it for free see the ads. It's a tough decision ahead (ads or no ads), but the important thing is to assure FD remains the premier feedreader available. Hi. I'm recent user of FeedDemon (and boy, do I love it). Personally I'm totally fine with the idea of ads in the way, that you are suggesting on the screenshot. I'm more interested in free and upgraded product, than in an another paid service, which is known only for few. Having said that, I must also admit, that of course I would like to use the ad-free version. But life isn't always fair. I'm OK with the ads if that's needed to support the product. You can hide it in the current version, but you have to hide the feed listing. I don't normally do that on my big desktop monitor, but on my netbook I often do that while reading. So far, I've not found the ads distracting, but I do dislike that I can't see a link in the status bar showing where the hyperlinks from the ads will take me. That works for links in feeds, but it looks like it's not hooked up for the HTML area that the ad display uses. If so, why the additional ads on the client? The placement reminds me a bit of Microsoft Money. Very relevant ads for people engaged in personal finance, but it does get in the way of the task at hand. I'm guessing these ads will not run on the desktop of NewsGator enterprise clients. The business decision is likely driven by the expected average revenue per user (ARPU) with advertising or selling the software. An ad-free at an equivalent ARPU should make business sense and is similar to Dell offering an installed copy of Windows without all the extra pieces of shareware and other bloat paid for by companies. How often does the ad refresh or rotate? I am one of the people who originally purchased FD (over 4 years ago). I think that the ads are well done. It is not hard to ignore them. I would be willing to pay a fee (one-time, yearly or by version) to remove the ads. I do not see any reason to "grandfather" in the people who originally purchased, I know that I've already received my money's worth. I think that FD is a great product and have no problem supporting its development. @unwiredben: Thanks for catching that about the URL not being shown in the status bar - I'll add that to the next build. @Antitorgo: Those ads aren't being inserted by us - those are in the feeds themselves. @Niall: The ads refresh every 2min, provided that FeedDemon is the active application. They don't refresh when you're using another app. We've been arguing about this for some time. We're probably going to try including these ads during the evaluation period, with an explicit opt-in when the product is registered, without which the ads disappear. The next hurdle is to choose a FutureWare product that will be the guinea pig for this, which I suspect might take a while. I do agree that these should never be included for customers who've already paid for a product; a small additional fee for upgrades seems much better than having ads show up. I'm also one of those that did pay for it when it was commercial. I *really* don't like the idea of ads and would certainly look for other RSS solutions if this is the chosen way forward. Clearly giving it away free was a mistake so why not make a lite version that's free and a pro version that is commercial? These ads are really a nasty bug in FD. This application is so good and these ads destroys it! I use FD for 1 year now (so far best RSS reader i found) and don't want to go to look for another. Please let remove these ads when make a donation or license! I *also* paid for the commerical version and I don't mind the ads at all. Several other sites I visit pull ads from The Deck and I've also never minded them, in fact I consider ads coming from them to be "blessed" as fairly good companies to do business with. What many people are missing is that they still have access to the commercial version they purchased. If you want an ads-free product you *already* have one, use it, no one is stopping you. I don't remember a "lifetime of free upgrades without ads" clause when I bought FeedDemon. That said I'd fully support a commercial version where people can pay to opt-out of the ads. Of course I'd continue to use the ad-supported one since it doesn't bother me at all. As a side note, seriously, how paranoid are you people that want to get rid of attention tracking? Let me pay for the program again, but please drop the ads! I paid for FD ages ago, I have no problem with the ads. It's been years since I paid for it and it's been updated heaps since then for free. I really can't see why everyone is getting so ticked off. The option for a paid ad-free version would be good for those who don't like ads, but you can't expect to pay $30 5 years ago & still keep getting free updates now. One thing I do wonder about is the content of the ads. Will they be contextual based on my subscriptions & location or will they be the same for everyone? Another very early pre-release user here, for whatever it's worth. I will pay, repeatedly if I have to, to have this removed. And like many of the others, I put up for an original license. I have nearly a thousand feeds in 35 folders, normally run full-screen at 1680x1050 and this cuts into the clippings without even expanding any of the folders. I realize I'm probably toward the right end of the curve, but this is going to be /much/ more intrusive the times I have to shift to the laptop. Like David above, I was mildly annoyed even by the newsbox sliver. I follow the relevant feeds myself and frankly didn't usually care about what was piped in there most of the time. I can't promise I'll leave(besides, I have a deep hatred of that tactic) but I'll definitely be reviewing options. As a sidenote--and I'm not especially interested in carrying this point through because I don't really believe it myself--but some people may see springing this in the RC as a trap. Is it possible to downgrade back to 2.7? Because otherwise the "don't use it if you don't like it" argument is going to lock them in with beta software. If paid ads are going to put into feeddemon, I must confess I'm no longer interested. I paid for this software to avoid having adds. Newsgator made the decision to offer the software for free, not me. I feel like I've been duped into a ad campaign against my will. If this was the long term plan, I'm not happy! Either charge for the software so I get on without the ads or be up front and tell me the real deal is to sell a ton of ads. I can then make a decision on how to move forward. I really don't like being held hostage and I really find this "bait and switch" offensive. In all fairness, The Deck(http://decknetwork.net/) doesn't really work that way. Everyone would do well to read about it before lodging complaints about the ads themselves. It's a short, single page. As a longtime user, I would pay for an upgrade, but I will not upgrade to an ad-supported version. My $0.02. As many commented above, I'd rather pay an annual fee than watch ads (my subscriptions tree takes 3 screens vertical space and the ads reduce the valuable space even more). P.S. I've paid for FeedDemon just a couple months before it became free, so it would be a real disappointment. For those talking about jumping ship to find something that doesn't have ads... Sure, you have Google Reader, Bloglines... How long do you think it'll be before the world's biggest advertising company decides to put ads into gReader? Bloglines displays an ad when you first login... It stands to reason that they'll add as well. Let's talk about what we get with FeedDemon... I don't know of any other FREE software that allows me to have a desktop client on each of my PCs; lets me read feeds on computers without FeedDemon via NewsGator Online; lets me read feeds on my iPod via NetNewsWire; lets me read feeds on my iBook with the desktop version of NetNewsWire; and lets me sync read/unread feeds on each of those devices. FOR FREE. This is software many of us would gladly pay for... and have paid for in the past. If there were a Pro version I'd probably pay again. But really, is the addition really all that bad? I think some people are over-reacting a little bit? I don't know about anyone else but it's been a long time since I paid for a version of FeedDemon even though I would have gladly paid for such good software all these years. Yes, Advertising isn't ideal but I can understand why it is necessary and if I have to give up a few pixels to ads in order to keep getting what I love for free then that is the price we have to pay in these uncertain times. If Newsgator offered a version of FD without ads then I will happily pay but to move off the fantastic product for the sake of a few pixels is possibly a little too knee-jerk. I fully understand where you Newsgator are coming from, but I have to say that I do not like the ads. I hate the ads so much that I was compelled to voice my opinion. Like others, I also paid for FeedDemon when it was new and the best thing in town. I've stayed with you and FeedDemon through the years. I put up with the Newsgator integration, but this is too much. I'm sticking with 2.7 for a while and begin keeping an open eye for something to replace it. I'd rather pay for FeedDemon than watch ads flash from the corner of my eye. They "are" distracting from what I'm trying to do, and that is read news. Thanks for a great product but I may not be sticking around for this new thing. BTW, no over-reaction here. I just can't stand ads in my software. 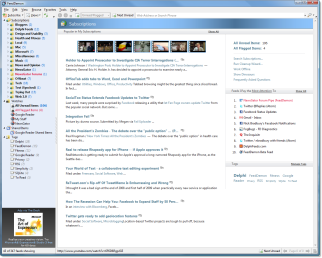 I'm another user who paid for FeedDemon before it went free, as it was, and still is, the best Windows RSS reader by miles. I will not use an ad-supported version. I'm willing to pay for upgrades, and for an ad-free version, but will stop using it if there is not such a version. I do feel that the inclusion now of ads is an admission of failure of the free model that NewsGator tried, and should be admitted as such, with the request to pay to opt-out of ads being reasonable enough under those circumstances, so long as it is made clear. I (and I'm sure many others) have no expectation of being entitled to free, high-quality, and maintained software, but ads don't form a part of that for me - please let me avoid them, and continue to use FeedDemon as I expected when I bought it - as a premium program. If you do this, I will drop FeedDemon immediately. I was (and am) happy to pay for it. If you go this route I'll find some other application. I'll be very sorry to see it, but this is intolerable. Is there *no* place free from advertising? Go back to charging for the app. I'll look for another client if ads are added. I paid for FeedDemon and I don't want ads. I would probably pay again to avoid this. - Drop the images from the ads, text-ads is less distracting and takes up less valuable space. - No not ever auto-cycle ads. Please only change ads when the feed is changed. - If you feel that the image ads is the only way to do things then please use a light background. As it is now, the dark background used is perhaps even more distracting than the ads themselves. Better yet, use the system window color as background so that it'll fit no matter what themes and colors users may be using. My main concern would have been the intrusiveness of the ads, but from the screenshot and explanation I can see there's nothing to worry about. As yet another previously paying customer, these are totally fine to me. All the talk about needing to monetize FeedDemon leaves me wondering, again, why you de-monetized it in the first place. Like others, I chose to pay for FeedDemon back when it was a commercial product. I was perfectly willing to pay for major updates, but instead you chose to make the software free. Now, you're bemoning the fact that free doesn't pay the bills, and it's time to run ads. That just doesn't make a lick of sense. Ads come in, especially in that way, it's time to move into a lesser client without them. The minimum will be blocking them and giving up on FD if it's too much work or doesn't work. I'd also rather pay for an ad-free version. Then again, if that happened, I'd be all over the forums demanding features such as content filtering and spam filtering to get rid of the rest of the ads. Funny thing, I've talking with my friends about sharing my custom styles I've been working on for a long time, just to inspire people into getting to it again - as there hasn't been that much action on customizing styles in years apparently. This ad thing alone made me drop that idea. You know, one important reason for finding out about the inner workings of FD and its styles was to make a crude form of spam filter (triggered by the kajillions of Obama "news" all over sites and feeds that aren't of political nature). It works to the degree it has to for my needs. I'm painfully aware that it is the exact reason FD never offered any kind of content filtering, so in that light it's not surprising that now we're going to get ads elsewhere in the interface. I guess its time to hunt for a FeedDemon Replacement. I am less bothered about the ad than about the dedicated space it takes on my screen. I am one of the increasing numbers of users who call a netbook their own, and screen space is vital to me. The current ads implementation takes quiet a bit of room, cannot be resized or replaced, which is certainly a disadvantage. Time to find new feed software. I refuse to use ad-supported software and paid for feed demon before. Perhaps you might consider the ad-free paid-for model Opera used to use. I reckon you'll lose loads of users over this...no ad is tasteful. Just adding my name to the "paid for it originally, would happily pay again, will not use the ad version" group. I do understand your predicament. Presumably FD wasn't selling enough licences by the end of its paid-for life, so you went free to build market share, with a view to an ad-based version once you had the user volume. A reasonable business model. The problem is that FD lives in the "advanced user" niche, people who happily pay for the best product in any sector, but will, I imagine, be more likely than average to avoid ad-backed programs. And even if they do upgrade to the ad version, many will (like me) use a product such as AdMuncher which will block ads in any program (it currently blocks the ads in my feeds). When I read, over at BetaNews, the comments about ads I was like "whaaaaa???" and started thinking of alternatives. But then I came here to read what the developers have to say and, upon looking at a screenshot I calmed down a bit. the fact that these ads are small, non-animated and nice is what made me shrug and just be thankful for the great product. Please let me pay again for FD but no forced adds. Personally I'm happy to continue to support FD development - in whatever way that works best for Newsgator / Nick and me (balance is a key point here). I would rather have the option to pay for a "no-ads" version to be honest. I have bought a couple of copies of FD in the past (extra copy when you were donating to the tsunami fund IIRC) but they were a few years ago so I don't feel anyone owes me any more upgrades. Looking at the screenshots my only concern is likely to be how much of the folder tree is lost on smaller resolution screens. Now I'm off to try the new beta version and see how it works. Oh, man. I'm already RSS-ed to half of the sites they advertise from. OK, so no viagra, timeshare, stocks. I'm fine with that. Screenshot of new interface is nice, but it's 1289x1033 pixels. At 1024x768 ad space is fairly large for my taste. How about making it minimizeable, down to the text portion of shown ad. If you like what you read, you can open the full ad, to see it in all it's glory. Perhaps have an option to integrate it with Watches functionality in some way. Please, please, please, pretty please, make the FeedStation install an optional feature. You have no idea how this single feature drives me absolutely crazy every time I install, re-install or upgrade FD. Going to start menu, hunting for FeedStation, hitting Uninstall. Can you really risk your karma, getting sweared at by pissed off customer at you for that? Those who need it will use it. Those who don't... is it THAT difficult to have a single checkbox at install window, saying no to "Install FeedStation (optional)"? "$6900 USD per ad per month and this rate is valid through March 31, 2009. Additionally, marketers who desire 100% of the page views on the network for a given day or days may be able to purchase a “roadblock” for $6200 USD per day"
I too purchased FD some time ago. I've been a big fan. I'm sure I've gotten my money's worth out of the product, thanks. It was FD look, feel, and speed that made running a native application well worth the negatives. Negatives being using a local application for something that begs to be web-based - oh and now the ads. I'm off to the cloud, maybe I'll be back. I'm a long time user of FeedDemon, and I've paid for it a few years ago. I didn't mind that FeedDemon became a free product. And right now, keeping the economic situation in mind, I have no objections against these small ads in FeedDemon. If there'd be a paid, ads-free version of FD and a free version with ads like this (but nothing more than this), I'd stick to the free version. I strongly oppose the ads. There are already enough ads in the feeds themselves. I too paid for FD a long time ago. It is one of the few apps I ever paid for (yes it really is that good). I was happy it became free, but I would gladly pay for upgrades if it kept the ads out. Newsgator made a conscious decision to stop charging for FD with the expectation of making money from the enterprise services. That was a voluntary choice on their part. Apparently it didn't work out, but to now penalize the customers with ads is not an acceptable solution. If the ads go in, I will stay with the current ad-free version and not upgrade. They should at least offer the choice of an ad-supported free version and an ad-free paid version. I will not use it anymore with ads. I started to use FD when it came out as free, because it was good and without ads. I hate ads. As this changes, I'll just have to say goodbye as many others will do. Anyway, good luck then. Even if you stop ads later, no one will come back. Trust is trust. Well I downloaded the new Feed Demon and I feel that not only is it the "Best" reader but even with the ad's running in the lower left, it is totally unobtrusive and a great way for Feed demon to benefit itself without hurting the customer. I loved the fact that these products are free and if having something like this in the reader is a way of keeping it so, let em' roll. Nick and all keep up the great work. If you start pushing ads I uninstall FD - simple as that! As a paid subscriber that renewed, I would be happy to pay again to have a version without the ads. Put the ads in if you must, but give people the opportunity to pay out of this. I just Twittered about the new Feed Demon http://twitter.com/bobo2854 and include it in Live Space. FeedDemon is a program I love and tell others about. I use several times each day. I appreciate Nick's efforts to upgrade and support the software. I understand why you are inserting ads and I am okay with it. I don't like the ad and the space it consumes. I paid for FeedDemon before. I would be glad to pay again, even an annual fee, to have an ad free version. As someone who uses Feed Demon and has never paid I wouldn't mind the ads. I'll happily accept this additional ad if a way to filter out in-feed ads also exists. As many users have already paid for the program, it gives the feeling of the Wikipedia "donation" fund raisers, only reversed. With wikipedia people have paid once in the form of their attention (clicks) and contributions (edits), and are now being asked to pay a second time in hard currency. FeedDemon is doing the same, but in the reversed order. Interesting. So FD, NG, etc. went free which drove another developer to discontinue developing his paid RSS reader product, now there is a minor revolt over the ad space in the lower left-hand corner. Maybe there is a market for a paid app after all? I was a little thrown by the ads when I first saw them last night, manily because of the loss of screen real estate. That said, FeedDemon is *still* the best feed reader. I say, "Keep up the great work!" This is the end of FeedDemon - at least for me. I used it regularly even when it was in Beta, and bought a license immediately when it was released. But now I do not even bother to download the RC. I will uninstall 2.8 Beta, reinstall the last released version and use it, until I decide for another reader. Goodbye FeedDemon, goodbye Nick Bradbury, you have been a Dev-Hero for me for many years (I am a dev myself). Really sad to see you go this (IMHO wrong) way. Why mimick all the idiots out there? I hope that one day you will recognize this, and come back with a paid ad-free version. I paid for FeedDemon before it went free for 2 years, last payment i did only a month before Feedemon went free without receiving a refund and now i find a product with ads ? I think this is a shame for your previous customers, not for people that began using Feedemon after was released as freeware. I use NetNewsWire and I would rather pay than see the ads. If you need to make revenue off your products, then you shouldn't have made them free. As a NetNewsWire user, who paid for NNW many moons ago, I can't really say I'm too worried about this. The Deck ads are indeed tasteful, and I don't mind them at all in sites I read and apps that have integrated them. In fact, I paid for Twitteriffic and left the app unregistered, since tha ads aren't bad, and I found it was a nice way to support the developers. All in all the Deck model of ads is a really nice one. Given how much crap advertising there is on the internet, these people have found a nice way to do it really well. I wouldn't want them covering my entire screen, but nestled down in the corner, it's really not a big deal. I'm glad you guys are finding a way to support the development, though I imagine these whiners would pipe down if you just let them buy your app again. Then again that's a pretty expensive option for you guys - having to create two separate versions, deal w/ payment, serial #s, etc. This strikes me as an interesting PR problem. Ads in a free product are not generally so controversial, but you've got the curse and blessing of a loyal customer base. Loyalty translates to emotion, which means this situation can't be analyzed with pure logic. In other words, your most valued, loyal customers are precisely the ones who are going to react emotionally first, and have the hardest time accepting your explanations on a purely rational level. I tend towards the opinion that re-establishing a paid version would be a good compromise here, of course there are hassles and responsibilities of selling the software directly to customers that you might be hesitant to re-engage with. And of course, maybe this vocal minority in the comments is just that. Perhaps an ads-laden free product by itself is in fact the only solution you need. Good luck figuring this out! Wow. I'm amazed at how many people are flipping out over advertisements. Last time I checked, all of this was taking place on the internet. You know, that place where 95% of the content is ad-supported? I admit I haven't been using FeedDemon from the beginning, I grabbed it after it became free, when I was looking for a better way to manage feeds across multiple computers. In fact, I'm fairly sure I found it via a banner ad. Look at what Newsgator is doing here: First, they're acknowledging that people have paid for FeedDemon, and they're doing the most reasonable thing there. You paid for a perfectly good product, and you get to keep it along with the rest of the service. You don't get new features, but it's not like the version you have is horribly unstable or unusable. Second, they even take it a step further, because I didn't pay for the current version of FeedDemon, but I could still theoretically keep it and never see ads. That's a pretty sweet deal. Third, they've decided to be fairly conservative with ads, and avoid all the things that generally drive me crazy like Flash ads (both plain video and the ones with sound that jump all over your screen), Intelltxt (possibly the spawn of the devil), and even just plain-jane obnoxious flashing GIFs. That's pretty cool. It seems perfectly reasonable to ask for a paid version as well as an ad-supported one, but threatening to switch to a different product is just pointless. If you want to switch, switch; I want Newsgator to keep developing this product, and I don't want to have to pay for it. I'll definitely download the new version. Ads in NNW would be fine by me. I've long wondered how NG was going to survive, given all my use of it (Mac client, iPhone client, and the website on rare occasions) has been free. The Deck is a wonderful and tasteful ad network and inclusion in NNW wouldn't bother me in the least. Kudos on a great product. Which search engine do you use practically every day? If the answer is Google, then there's no other way to put it, but you're a hypocrit. I don't mind the idea of ads personally, but I've been promoting NewsGator products inside a corporation, and ads just aren't viable in most corporate environments. I personally use NNW, but the company is a mix of operating systems, so what FD does impacts this decision. And because we give everyone the same software, if we can't use FD, we can't use NNW either. There's something about how corporations work that just doesn't fit with ad-supported software. I'm not entirely sure what the reason is, but I think maybe it's that the entire budgeting process is built around the assumption that the company buys the software and the employees use it, whereas ads make the employees directly responsible for funding the software. In any case, it's a non-starter here, and I suspect at most corporations. So just be aware that the lack of an ad-free version won't just lose you individual customers; it'll cut you out of a whole market of corporate software. Maybe that's not a market you need, but I'd really like to be able to continue using NewsGator products in my own company, so I hope you'll offer an ad-free version going forward. Any reference to the current economy hardly makes sense. That insinuates the ads were put in place in lieu of licensing fees, etc, but free is free, regardless of the current state of the economy. NewsGator made a business decision to turn the client into a free client, presumably to build brand equity. By making it free, they were hoping to reach critical mass, and enjoy the fruits of ubiquity within the market place. Frankly, to be equitable across the board, NewsGator should offer a version to paid customers that would give them the option of turning off the ads. Many, out of a gesture of good will, might still want to see the ads because they don't seem that intrusive. To those that don't own a paid license, offer up the same version with ads - similar to Twitterific. This isn't about nuisance, intrusiveness or anything of the sort. This is about principle - and you are rarely going to win an argument of principle with your customers, unfortunately. or once a year. Ads hurt EVERY TIME I use your app. See, if you want the money, charge the users who want to pay for it. Making it free and then serving ads means that people who'd gladly support you with a fee now not only get shunted to an ad only version which they don't want, it also makes people wander why you made the grand move of going free at all, when you want the money. People want to provide the fee for a clean interface. You'd rather take the money by shoving "tasteful (ya right)" ads on their face. The equation just doesn't stand. And for freeloaders, let them use Google Reader! Not to be dissuaded, I'm gonna throw my full support behind your choice to start implementing ads, but ONLY if they're from The Deck. I prefer your screenshot's layout. I can't believe how indignant some of the folks on this thread have been. "No ads, or I walk." Wow. That's a pretty amazingly selfish ultimatum, even if you say you ARE willing to pay a yearly fee. Maybe it's just me, but I even take issue with the folks who say "do what you gotta do to keep this stuff free." That's an extremely selfish first thought, too. My first thought was, "hell, you guys have to run a business, and you all gotta eat. Tough times." I don't know much about NewsGator as a company, except that I get several services and pieces of software from them for free, with very little indication that they're quietly getting any compensation from me. Seems like a lopsided relationship, and this blog post is proof positive that that's correct, and something's gotta give. If that means tasteful ads from The Deck, no matter how much of my screen real estate they take up, then I say do what you gotta do. I paid for NetNewsWire, back before it was Newsgator. 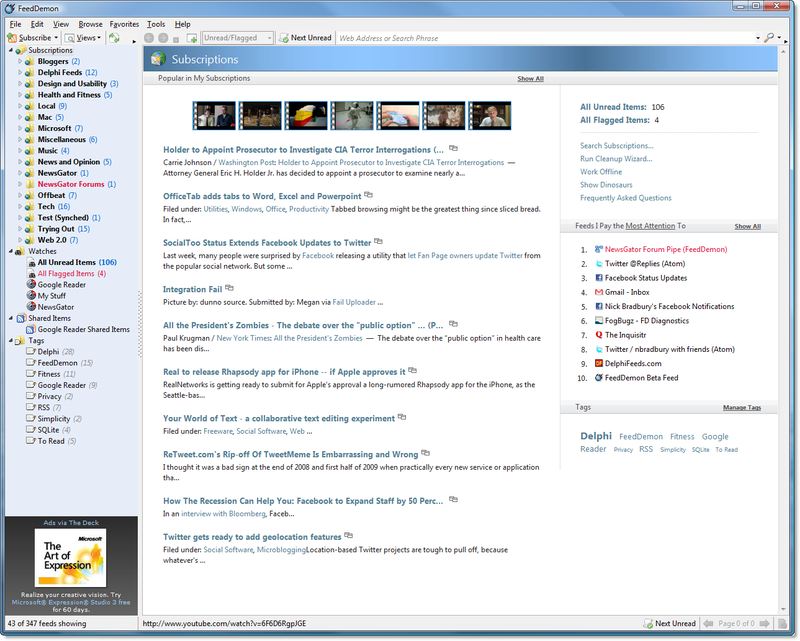 Since then, I got (or started to use) truly fast syncing (the old FTP sync wasn't that great), FeedDemon and Mobile NetNewsWire. I think I got far more value out of anything Newsgator than I ever put in, and I absolutely won't mind any ads appearing (though it would be too much to say that I'd be happy about them). I'd probably not pay for the without-ads version, though, at least not if that was the only benefit for the expensive version (and possibly not even if there was more, I'm pretty happy as it is). What a bunch of friggin whiners. I hate advertising so much that if my favorite application added it, I would immediately switch away from my favorite product and use one that I don't like as much. In fact, the entire concept of advertising is so abhorrent to me that I will never purchase any product that has ever been advertised in any way. When driving, I plan all of my routes to avoid roads with billboards alongside them. It takes me an extra hour to get to work every day, but it's worth it to avoid those dang-blasted ads! Also, I move to Canada every time my chosen candidate loses an election. If the country isn't perfect in every way, there's no point in staying! Silly idea: instead of an image, why not put the ads as simple one or two line text at the status bar? Unobtrusive text ads seem to work for google. I'm familiar with the Deck, many of the Deck's "member" web sites/blogs, and many of the Deck's regular advertisers. The Deck is a well-conceived program: the ads are unobtrusive and tasteful. But it's strongest point from an advertiser's perspective is the targeting involved. Do FeedDemon readers as a whole fit within the Deck's target demo? If I'm subscribed to feeds that don't have anything to do with "creative, web and design culture" (as Coudal puts it over on the Deck's web site), why would a Deck advertiser want to pay for my eyeballs? I was also was a paying customer, paid my money weeks before this app went free. Let me pay again. Not a fan of ads. As a long-time user of FeedDemon, NetNewsWire, and Newsgator, I can understand why you decided to make your consumer products free. I can understand why you are now experimenting with ads. I can also say without hesitation that I won't leave this platform - there are too many advantages to Newsgator's syncing, and FD and NNW are the best aggregators I have used, hands down. That said, please consider offering an alternative to ads. I gladly pay for quality software, but if The Deck uses a pay-per-click model, you probably would get no revenue from me - the ads are simply not relevant to me. What a bunch of whiny crying babies. Is this the same bunch that plasters Apple stickers on their cars? Do you avoid EVERYTHING in this world that has advertising? How do you survive day to day? Get over it. I suggest this thing called "fresh air". It would do y'all a lot of good.